Rick is one of our 'far flung' members, and sends the following. First, may I wish you and everyone at the LBT a very happy and peaceful Christmas. One of the highlights of 2013 for me was participating in the raid and I have wonderful memories of the time we all spent together. I hope to be with you all again for the 2015 raid. Some news from up here at Drysdale. 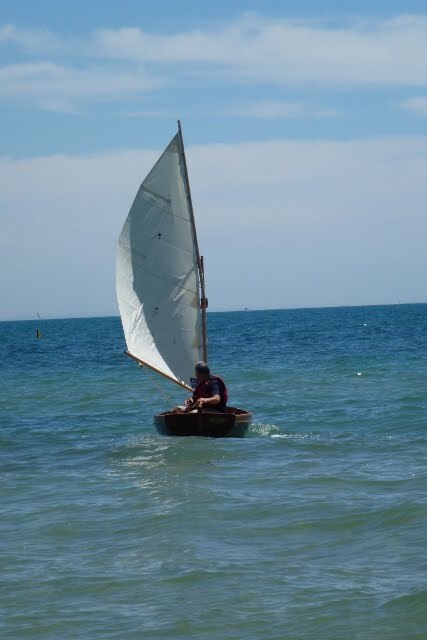 After a very long and extended gestation my Foster 10 dinghy, "The Ship", was finally launched last Sunday. She settled into the brine in a very ladylike and dignified manner. The naming ceremony was performed by my wife, Sue and at the same time a small amount of the bubbly stuff was splashed over her bow. Rowing and sailing her demonstrated a calm and gentle nature (admittedly weather conditions were fairly benign). You may be wondering about the name. 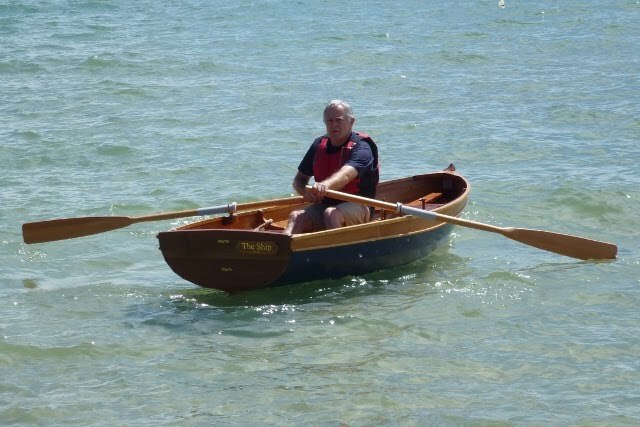 The story is that when I was volunteering for The Wooden Boat Centre at the 2011 Wooden Boat Festival I was photographed by The Mercury photographer with Ron Stewart, a shipwright from Northern NSW. Subsequently we finished up, larger than life, on page 3 of the Saturday’s paper. To my great embarrassment the photo caption described me as a “shipbuilder”. The only solution to my embarrassment was to legitimise myself. But how to do this was now my problem. A rush of blood to the head solved the problem and I decided to name my vessel “The Ship”. During August we spent a couple of weeks in Scotland. When crossing over to Skye on the ferry I could not help but remember that beautiful rendition by Peter of the Skye Boat Song at the end of raid celebration. We also visited Ullapool and heard some very complimentary comments about the Australian ladies who competed in the World Championships – well done ladies.